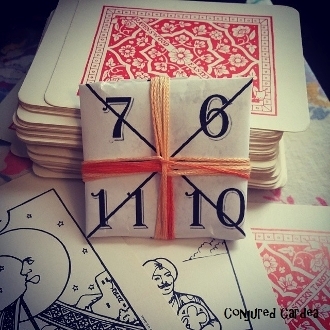 This paquet is created from a number square, an ancient form of ceremonial magick. That is, a desire is determined, the numbers for each letter in that word (your desire) are determined according to numerology, those numbers are then added up. The resulting number is the beginning point for a sequence of numbers, these numbers are formulated into a square filled with the a pattern of numbers creating a sigil. Sound complicated? Good thing it's already done for you:) This sigil is for Jupiter. I work with Jupiter's planetary influence, as well as the actual deity, any time I create something geared towards achieving goals, success, or wealth. I am a Sagittarius, which also corresponds with Jupiter which is another reason I am close with this energy. This sigil was created under the invocation of Jupiter on Thursday, the corresponding day of this planet. Now, for the paquet. Tobies, Hands or Paquets are designed to be added to your already created gris gris or nation sack. This particular type of magick is almost lost, I do not know anyone who creates paquets anymore. They are small bundles of herbs, roots, powders, and stones folded up in vellum with or without veve's or sigils. These are very special indeed! My favorite kind of magickal work and a specialty of mine. I have made them for clients for nearly 15 years. If you would like a custom paquet, please convo me! One reason they are my favourite is because they give you the most bang for your buck, are discreet, and are a talisman and offering all in one! When you receive your paquet, write your name on it (or whomever it is to be worked for) soak it in a enough whiskey or rum to cover it for 24 hours. Remove it and allow it to dry; the evaporating rum or whiskey is the offering to the deities. Then, add it to your mojo, gris gris, or nation sack. This paquet is filled with lodestone, devil's claw, clove, cinnamon, sassafras root, patchouli, basil, and a few other secrets to bring you success! thanks for looking! curio only.